There is a huge and untapped opportunity for brands in women’s sports, but marketers must not treat them like “mugs,” according to Tanya Joseph, director of business partnerships at Sport England. Speaking at Advertising Week Europe, Joseph talked about how brands looking to tap into women’s sports must speak to female consumers in an honest and truthful way. They will not be deceived by unrealistic images like women looking fantastic in a spinning class, or running a marathon without breaking a sweat, she said. “We know when we are being sold a lie,” she said. 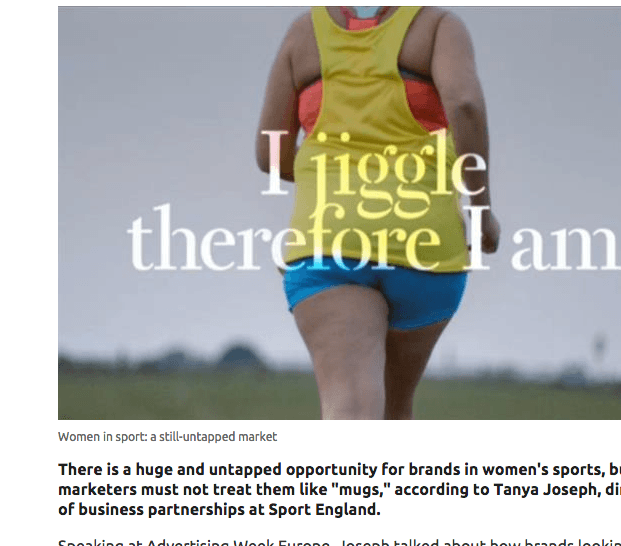 “What women want is brands that respect them enough to tell them the truth.” She said that Sports England’s much-lauded “This Girl Can” ad proved it is possible to make beautiful ads that are honest. The highly-awarded ad encouraged 2.8m women (aged 14-40) to do more sport and exercise in the year following its launch. Joseph said in order for women to engage in sports marketing, brands need to focus on storytelling. She pointed to the excitement around the rise of Leicester City in the Premier League as an example of how powerful storytelling is in sports. “It’s not just an extraordinary journey, it’s a lovely story,” she said.